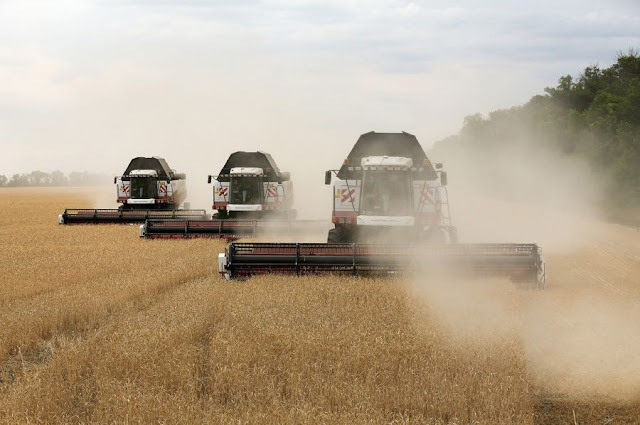 The situation is so bad in Germany -- temperatures exceeded 30 degrees Celsius (86 Fahrenheit) for much of May and June -- that many farmers are destroying crops rather than attempting to harvest them, said Joachim Rukwied, president of farmers’ association DBV. Crop failures in the EU’s No. 2 grains grower, on top of last year’s poor harvest, could bankrupt many growers, German agricultural cooperatives group DRV warned last week. Those lucky enough to collect a decent harvest could benefit from higher prices. Wheat traded in Paris has rallied 17 percent this year, heading for the first annual gain since 2012, also helped by concerns about crops from Russia to North America. With world output set to drop for the first time in six years, that’s eroding a glut which sent Chicago prices tumbling almost 60 percent from a 2012 peak. So far the drought hasn’t fed through to higher consumer prices, Alois Gerig, head of the agriculture committee at the German parliament, told Deutschlandfunk radio Monday. PARCHED Britain faces another six weeks of blazing sunshine with hardly any rain as forecasters warn the heatwave could last all summer. The mercury will skyrocket again this weekend after a slight dip in temperatures brings relief to parts on Tuesday and Wednesday. The rest of July will be dominated by stiflingly hot weather with August shaping up to deliver more of the same, experts warn. 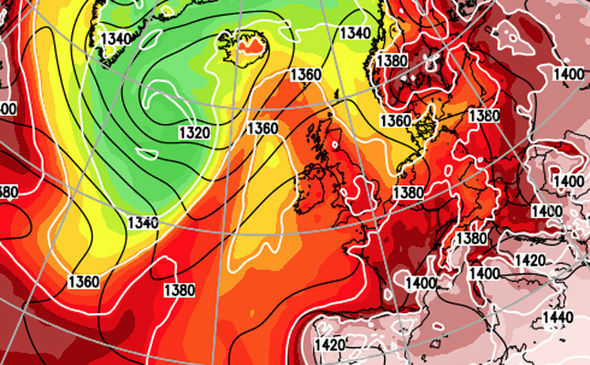 A ‘monster heatwave’ at the end of next month could tumble all records bringing to an end one of the hottest summers in decades. Relentless heat driven by clear, cloudless skies with little or no rain shows no signs of backing off before the end of next month. Showers across northern and western parts of the country tomorrow and Wednesday will do nothing to head off an impending drought crisis, according to the Met Office. Spokesman Grahame Madge said temperatures will be back into the 30Cs by the start of the weekend. He said: “We expect slightly fresher conditions on Tuesday and Wednesday, although temperatures will still be above-average, it is getting warmer again at the weekend. “In the north and in parts of the west including Wales there will be some showers over then next couple of days but by Wednesday lunchtime we are back to clear skies and dry weather across the country. “This weekend we are looking at temperatures of 30C (86F) or 31C (87.8F) again. “There is little prospect of any rain anywhere after Wednesday, the whole of the south and east are looking fine, dry and very warm through next week. Blisteringly hot weather is likely to hold out through the rest of summer and even into autumn, long-range forecasters warn. Britons struggling in the merciless heat have been told to prepare for the weather to turn even hotter by the end of next month. Exacta Weather forecaster James Madden said: “During the back end of July we expect a return to dominant high pressure and another significant rise in temperatures. It will feel cooler and fresher over the next couple of days which with the chance of showers across some regions, he said. However parts of the country including southeastern England, will hold onto the extreme heat and dry conditions, he added. He said: “The next couple of days will bring a slightly more changeable and cooler theme compared to the past few weeks. “There will also be some much-needed rainfall in parts. “However it will continue to feel very warm with long spells of decent summery weather among the passing weather fronts and showers. The Finnish Meteorological Institute issued an intense heat warning for southern Finland on Monday. This summer’s highest temperature so far was recorded on Monday afternoon in Turku, where the mercury climbed to 32.2 degrees Celsius. The previous heat record was just from yesterday when 31.2 degrees were measured in the south-western town of Pori. 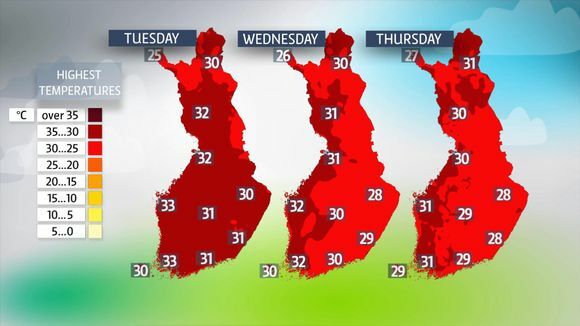 Meteorologist Joonas Koskela from Yle says it is likely that even higher temperatures could be seen later this week. 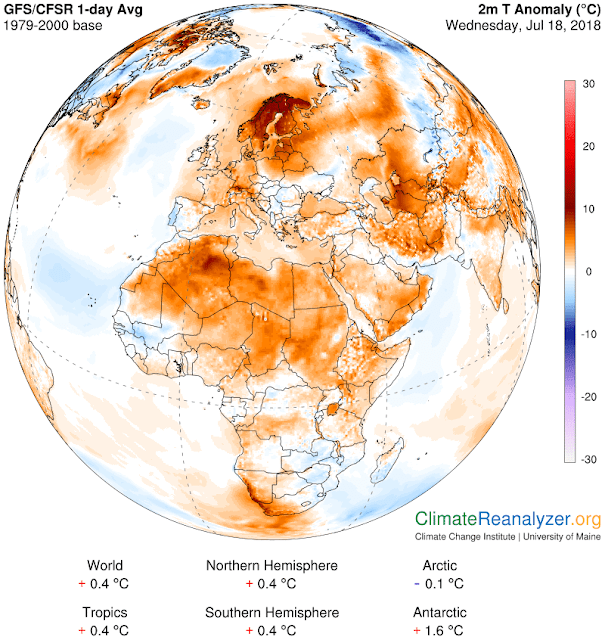 ”Warm air is stuck above Finland and winds are quite weak. The heat is here to stay for a while,” Koskela says. The Finnish Meteorological Institute issued an intense heat warning for southern Finland on Monday and the warning will likely be expanded to cover the rest of the country later this week, Koskela adds. Intense heat warnings are given when daytime highs soar to 30 degrees and the average temperature over a 24-hour period does not fall below 24 degrees. So called tropical nights, when the temperature remains at or above 20 degrees are possible this week, especially on the southern coast and in the vicinity of lakes, Koskela says. However, some relief is expected towards the weekend when rain and thunder storms are likely to pound western and northern Finland. ”In some areas, rains could be very heavy, up to 10 millimeters,” Koskela says. Thousands of people have been forced to evacuate their homes due to forest fires in Sweden and the Swedish TV SVT reported on Tuesday that fires are now burning in 80 different locations throughout the country. The forest fires started during the weekend and have now spread across whole Sweden. According to the Swedish Civil Contingencies Agency several buildings have burned and there is a risk that more could be destroyed. "The weather is expected to be the 'worst imaginable' with 30 degrees heat, extremely low humidity and heavy winds," fire chief Johan Szymanski told SVT. Six Norwegian helicopters have flown to Sweden and two Italian firefighter airplanes are arriving on Tuesday evening to help stop the raging fires. The Swedish Civil Contingencies Agency has also asked the European Union for help, and volunteers are searched throughout Sweden as the resources of local fire departments and home guard are not enough. In parts of Sweden, it has become impossible to try to extinguishing forest fires as they have reached Swedish Armed Force's artillery target area which may contain dud explosives. "We immediately cleared the area with a risk distance of 600 meters. It became too dangerous. Soon we will withdraw the helicopters as well. There is not much we can do right now," says fire chief Johan Szymanski.